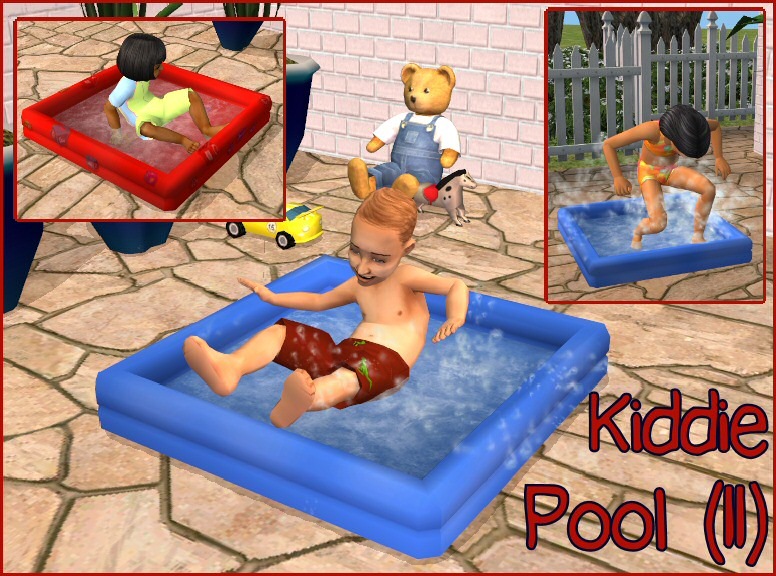 Kiddie Pool, New and Improved! - If the toddler or child has swimwear, they will change into that before playing. If not, they will change into underwear/diapers. It does NOT override the original wading pool. The default appearance is the blue version. It includes one sample recolour, which is red with pictures of building blocks on it. Policy: Do whatever you like, credit is appreciated. EPs: This is base game compatible and does not override any default behaviour. Way back at the dawn of time... February 2005, anyway... I was quite the newbie on the sim scene. There was very limited information on modding, so I spent days messing with this and that, trying to get a puddle to be buyable and not to disappear over time, and eventually got it working. I was pretty darned proud. That was my original "Functional Wading Pool". Phae mentioned to me today that there was a bug in that very old object, but when I went to look at it I realised just what a horrific mess the code in it was. If I knew then what I know now, and all that... She also asked if it was possible to have toddlers change into swimwear before playing. So I re-made it. This is the result. These recolours may or may not be endorsed by Echo.